About: Bringing over 15 years screen printing experience to the table. Our attention to detail is top notch and our prices are much lower than other printers. About: We have 22 employees ( 6 being artists) Our salesmen and artists go to trade shows (mainly school shows) and draw for coaches of various sports. We do work all over the US. About: Custom graphic, screen printing, and embroidery. ​16925 E. 9 Mile Rd. 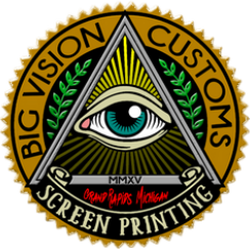 About: We have been in business for over 37 years doing custom screen printing. We have great prices and offer great service. We have free shipping on all custom orders. About: Sport-Tee is a screen printing and embroidery shop. We have a 4-5 day turnaround, we run manuals and automatics, and ship anywhere in the United States. We have a website to assist you and all your shopping needs. About: Direct to garment custom t-shirt & apparel company. About Brown Manufacturing Group, Inc.: Manufacturer of innovative quality screen printing equipment. We offer a wide range of products for large production shops to small shops. About: IG has over 85 graphic designers and embroidery digitizers providing services to several leading companies and top brands across the world. We operate 24 x 6 from India. Our marketing office is located in Novi, Michigan, US. Are you a screen printer, t-shirt printer or sign shop in Michigan? Join ASPA. The Web's #1 Screen Printing Directory. American Screen Printing Association has members throughout USA and worldwide. ASPA members offer services ranging from screen printing, custom t-shirts, signs, and promotional products.